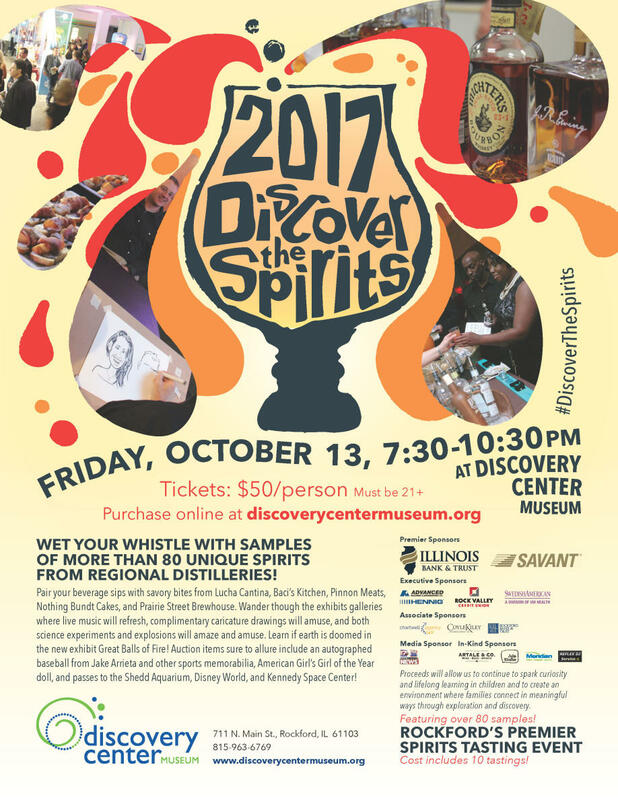 Discovery Center welcomes all big kids ages 21 and older to join them for their signature fundraiser, Discover the Spirits, on Friday, October 13 from 7:30 to 10:30 pm. Immerse yourself in an evening of frivolity and fundraising at this music–science–spirit-filled night! 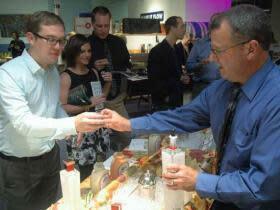 Sip and sample more than 80 spirits from regional and Chicago-based distilleries and guaranteed to please your palette. 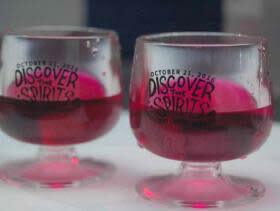 Enjoy many unique and hard-to-find spirits along with signature drink samples. As you unwind at this relaxing evening at the museum, you can pair your beverage sips with tasty tidbits from the area’s favorite restaurants. Wander through the exhibit galleries where live music from local bands will soothe and refresh, and on-going science experiments and explosions will amaze and amuse. Take home a lasting memory with a caricature. Auction items sure to allure include sport memorabilia including an autographed baseball from the Cubs own Jake Arrieta, American Girl Doll’s Girl of the Year, and passes to the Shedd Aquarium, Disney World and Kennedy Space Center! “This is a one-of-a-kind event,” explains Marketing Director Ann Marie Walker. “Where else in Rockford can you help a child by acting like a child? All the proceeds support our mission to inspire a love of science among the children in our region,” Walker adds. Complete the evening’s escapades by experiencing Discovery Center’s newest temporary exhibit without the kids! Visit Comets, Asteroids, and Meteors: Great Balls of Fire! and design your own solar system, hold a comet in your hand, take a meteoritic sampling, and find out just how big space is. Get the skinny on whether space debris doomed the dinosaurs, and find out just how hard it would be for Han Solo to navigate a real asteroid field. Enjoy a night of spellbinding fun for just $50/person (includes 10 tastings). Reserve your spot online at DiscoveryCenterMuseum.org or call 815-963-6769. This event is sponsored by Illinois Bank & Trust and Savant Capital Management, with additional support from Hennig/Advanced Machine & Engineering; Rock Valley Credit Union; SwedishAmerican – a division if UW Health; Rockford Bank & Trust; CoyleKiley Insurance; and Chartwell Agency. In-kind support comes from Artale Wine Co.; WTVO/WQRF; Meridian; Julia Kindler Design and Reflex DJ Service.